Manchester United Football Club is an English football club based in Old Trafford, Greater Manchester. The club was formed as Newton Heath LYR Football Club, the works team of the Lancashire and Yorkshire Railway depot in Newton Heath, in 1878. The club split from the railway company in 1892 and remained under private ownership for almost 100 years, changing its name to Manchester United after being saved from bankruptcy in 1902. The club went public in 1990 and was the subject of takeover bids from property trader Michael Knighton and Rupert Murdoch's BSkyB corporation before Malcolm Glazer's stake was announced in September 2003. By the end of the year, Glazer had increased his shareholding from 3.17% to around 15%, which he almost doubled in the year up to October 2004. His acquisition of John Magnier and J. P. McManus's 28.7% stake in May 2005 pushed his own up to around 57%, well over the 30% threshold that would force him to launch a takeover bid. A few days later, he took control of 75% of the club's shares, allowing him to delist the company from the stock exchange, and within a month, the Glazers took 98% ownership of the club via their Red Football parent company, forcing a squeeze out of the remaining 2%. The final purchase price of the club totalled almost £800 million. Most of the capital used by Glazer to purchase Manchester United came in the form of loans, the majority of which were secured against the club's assets, incurring interest payments of over £60 million per annum. The remainder came in the form of PIK loans (payment in kind loans), which were later sold to hedge funds. Manchester United was not liable for the PIKs, which were held by Red Football Joint Venture and were secured on that company's shares in Red Football (and thus the club). The interest on the PIKs rolled up at 14.25% per annum. Despite this, the Glazers did not pay down any of the PIK loans in the first five years they owned the club. In January 2010, the club carried out a successful £500 million bond issue, and by March 2010, the PIKs stood at around £207 million. The PIKs were eventually paid off in November 2010 by unspecified means. In August 2012, as part of further refinancing, the Glazers sold a number of shares in Manchester United in an initial public offering (IPO) on the New York Stock Exchange (NYSE). Some Manchester United fans opposed Glazer's takeover of the club, particularly once they realised the level of debt that the club would have to take on after having been debt-free for so many years. Since 2005, the Manchester United Supporters' Trust has been working on a way of returning ownership of the club to supporters; in 2010, they met with a group of wealthy Manchester United fans – dubbed the "Red Knights" – to discuss a billion-pound takeover bid. However, the bid fell through when the Red Knights refused to meet the Glazers' valuation of the club. Manchester United was the subject of a takeover bid from Rupert Murdoch's BSkyB corporation in 1998. Manchester United was formed as Newton Heath L&YR F.C. in 1878 by the workers in the Carriage and Wagon Works of the Lancashire and Yorkshire Railway's Newton Heath depot. In 1901, the club was in over £2,500 of debt and facing a winding-up order; however, they were saved by local brewer John Henry Davies, who changed their name to Manchester United in 1902. After Davies' death in 1927, the club fell into financial difficulties once again, but James W. Gibson stepped in as a new financial benefactor in 1931. Gibson himself died in 1951, but while ownership of the club passed to his widow, Violet, control of the club passed to director and former player Harold Hardman. Meanwhile, a local businessman named Louis Edwards began accruing shares in Manchester United and was eventually made chairman on Hardman's death in 1965. His son, Martin Edwards, purchased a percentage of shares from Alan Gibson – son of former owner James Gibson – and became the majority shareholder and chairman when Louis Edwards died in 1980. During Martin Edwards' time as chairman, Manchester United was the subject of several takeover bids; the first came from media tycoon Robert Maxwell, who bid £10 million in February 1984, but the sale fell through before any serious talks could take place. In 1989, property magnate Michael Knighton was on the verge of completing a £20 million takeover, but his financial backers pulled out at the last minute and he had to be content with merely a seat on the board. Manchester United was floated on the stock market in 1991, and they received yet another takeover bid in 1998, this time from Rupert Murdoch's BSkyB Corporation. The Manchester United board accepted a £623 million offer, but the takeover was blocked by the Monopolies and Mergers Commission at the final hurdle in April 1999. A few years later, a power struggle emerged between the club's manager, Sir Alex Ferguson, and his horse-racing partners, John Magnier and J. P. McManus, who had gradually become the largest shareholders via their company, Cubic Expression. In a dispute that stemmed from contested ownership of the horse Rock of Gibraltar, Magnier and McManus attempted to have Ferguson removed from his position as manager, and the board responded by approaching investors to attempt to reduce the Irishmen's influence. Meanwhile, Avram Glazer – the son of Malcolm Glazer – was looking into investment in European football. The Glazer family already owned several businesses in the United States and had purchased the Tampa Bay Buccaneers National Football League franchise in 1995. They convinced the local government to fund a new stadium for the Buccaneers in 1998 and the franchise won its first Super Bowl in January 2003. The building of Raymond James Stadium in Tampa, Florida was one of the first major changes made by the Glazers after their acquisition of the Tampa Bay Buccaneers. Following the Manchester United board's search for new investors, the Glazers purchased their first tranche of Manchester United shares on 2 March 2003, spending around £9 million on a 2.9% stake, which they purchased through a holding company called Red Football. On 26 September 2003, it was reported that they had increased their share to 3.17%, taking their shareholding above the 3% threshold that required them to inform the club's management. There had already been considerable speculation about the possibility of a takeover of the club, either by the Glazers or by one of several other interested parties. By 20 October, they had increased their shareholding to 8.93%, and on 29 November it was reported that they owned around 15% of the club and had met David Gill, its chief executive, to discuss their intentions. On 12 February 2004, the Glazers increased their stake in the club to 16.31% and the following day's Financial Times reported that they had instructed Commerzbank to explore a takeover bid. The club's share price increased by 5% that day, valuing the club at a total of £741 million. The Glazers increased their shareholding to over 19% the following June, although they were still not the largest shareholders. Their shareholding continued to increase, nearing 30% by October 2004. Upon reaching 30%, they would have to launch a formal takeover bid. On 12 May 2005, Red Football announced that it had reached an agreement with shareholders J. P. McManus and John Magnier to purchase Cubic Expression's 28.7% stake in the club, which gave the Glazers a controlling stake with just under 57% of the club's shares. They then managed to secure the stake of the third-largest stakeholder, Scottish mining entrepreneur Harry Dobson, taking their share total to 62% of the club. By 13 May, the Glazers had bought a further 12.8% stake taking their total ownership to 74.81%, just shy of the 75% threshold that would allow them to end the club's public limited company (PLC) status and delist it from the London Stock Exchange. On 16 May, the Glazers took their shareholding in Manchester United to 75.7%, and a month later, on 22 June, they removed the club's shares from the stock exchange for the first time in 14 years. The Glazers' shareholding increased gradually to 76.2% by 23 May, when they made their final offer of 300 pence per share, with a deadline of 3 p.m. on 13 June. On 26 May, the Manchester United board wrote to the remaining shareholders indicating their intention to sell their own shares and advising the others to follow suit; in the same letter, chairman Sir Roy Gardner and non-executive directors Ian Much and Jim O'Neill offered their resignations. Despite the board's encouragement, the Glazers' share in the club had only reached 97.3% by 14 June, short of the 97.6% threshold required for a compulsory buyout of all remaining shareholders, prompting them to extend the deadline on their offer to purchase the remaining shares until 27 June. A statement released on 28 June said that Red Football's shareholding had reached 98% (259,950,194 shares), prompting a squeeze out of the remaining shareholders. The final valuation of the club was almost £790 million (approximately $1.5 billion at the exchange rate at the time). 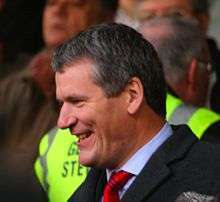 The Glazers retained David Gill as chief executive of Manchester United after taking control in 2005. As a result of the Glazer takeover, a small group of disgruntled Manchester United supporters created a new club called F.C. United of Manchester. This so-called "phoenix club" was accepted into the North West Counties Football League second division, six promotions away from The Football League, and secured promotion in each of its first three seasons, twice as league champions. Following the takeover, Manchester United continued to thrive, with the 2005–06 season seeing Old Trafford's capacity being expanded and a lucrative new shirt sponsorship deal signed in April 2006 with American company AIG (which had a large stake in a hedge fund company that helped to fund Glazer's takeover of the club). Increased revenue from TV rights to each competition the club participates in, as well as its various sponsorship deals, also boosted the club's profitability. This came despite fears among many supporters that the debt incurred in buying the club could lead to insolvency. Contrary to the fears of many fans, the Glazers took action to ensure that Gill and veteran manager Sir Alex Ferguson remained at Manchester United, citing the duo's success with the club. In 2006, Malcolm Glazer's other two sons, Kevin and Edward, and his daughter, Darcie, were appointed to the Manchester United board as non-executive directors. The debt taken on by the Glazers to finance the takeover was split between the club and the family; between £265 million and £275 million was secured against Manchester United's assets, putting the club into debt for the first time since James Gibson saved them in 1931. This loan was provided by three New York hedge funds: Citadel, Och-Ziff Capital Management and Perry Capital. The total amount was £660 million, on which interest payments came to £62 million a year. The club stated, "The value of Manchester United has increased in the last year, which is why lenders want to invest in the club ... This move represents good housekeeping and it ensures that Sir Alex Ferguson will be provided with sufficient funds to compete in the transfer market." The Manchester United Supporters Trust responded, "'The amount of money needed to be repaid overall is huge ... The interest payment is one thing but what about the actual £660 million? It is difficult to see how these sums can be reached without significant increases in ticket prices, which, as we always suspected, means the fans will effectively be paying for someone to borrow money to own their club." Under the terms of the Glazers' refinancing, as they were unable to repay bondholders by 16 August 2010, the overall interest rate on the loans rose from 14.25% to 16.25%, resulting in annual payments of around £38 million. On 11 January 2010, shortly before an announcement that Red Football's debt had increased to £716.5 million ($1.17 billion), Manchester United announced their intention to refinance the debt through a bond issue worth approximately £500 million. They managed to raise £504 million in just under two weeks, meaning that they were able to pay off almost all of the £509 million owed to international banks. The bonds were issued in two tranches, one with a coupon rate of 8.75% worth £250 million, and the other with a coupon rate of 8.375% worth $425 million. The annual interest payable on the bond came to approximately £45 million per annum, with the bond due to mature on 1 February 2017. Contained within the bond prospectus were covenants that would allow the Glazers to filter large sums of money out of the club to repay the PIKs by 2015. These include the carving out of £95 million in cash, the sale and lease-back of the Trafford Training Centre at Carrington, and the ability of the Glazers to pay themselves 50% of the Consolidated Net Income of the club every year. On 16 November 2010, it was revealed that the Glazers were to pay off the remaining £220 million contained within the PIK loans by 22 November 2010. The loans were by then accruing interest at a rate of 16.25%, as the club's overall debt had exceeded its earnings before interest, taxes, depreciation and amortization (EBITDA) by more than five times. However, the club claimed that none of its own money had been put towards the repayment, raising questions as to how the Glazer family had raised the funds; suggested methods include the sale of a minority stake in the club to a third party, the sale of some or all of the family's other businesses, and – the most likely option – the refinancing of the PIKs with another loan at a lower interest rate. A fan campaign known as "Love United Hate Glazer" has existed since the origin of the family's bid to take over the club. The campaign has involved the spreading of the slogan and the acronym "LUHG" around various locations via stickers and graffiti. A number of banners have also been displayed in the stands at Old Trafford. Despite its restructuring, the announcement about the club's debt prompted vociferous protests from Manchester United fans on the weekend of 23 January 2010, both at Old Trafford and at the club's Carrington training facility. A non-violent protest was organised by the club's supporters groups, following up on the "Love United Hate Glazer" campaign that had existed since 2005, and encouraging match-going fans to wear green and gold, the colours of Manchester United's precursor club, Newton Heath. A few days later, on 30 January, reports emerged that the Manchester United Supporters' Trust had held meetings with a group of wealthy fans with a view to buying out the Glazers' controlling interest in the club. The group then met with Keith Harris, a Manchester United fan and the chairman of investment bank Seymour Pierce, to broker a takeover. On 2 March 2010, further reports emerged that the group – dubbed the "Red Knights" – had met again to discuss the possibility of a billion-pound takeover of the club. Those present at the meeting included investment bank Goldman Sachs' chief economist and former Manchester United director Jim O'Neill and lawyer Mark Rawlinson, a partner at law firm Freshfields Bruckhaus Deringer, as well as Duncan Drasdo, the chief executive of the Manchester United Supporters' Trust, and Keith Harris, Executive Chairman of Seymour Pierce. The initial goal of the group was to increase the Supporters' Trust's membership to at least 100,000, to demonstrate the fans' support for a change in ownership. To better promote themselves, the Trust enlisted the services of Blue State Digital, the Internet strategy firm that worked on Barack Obama's 2008 presidential election campaign. Later that day, Manchester United announced that their gross debt for the final three months of 2009 totalled £507.5 million, a reduction of £30.6 million compared to the same period in 2008. They also reported pre-tax profits of £6.9 million, an increase of £9.6 million after making a loss of £2.7 million the previous year. This announcement was accompanied by a statement from the Glazers' spokesperson that the club was not for sale, as well as public support from David Gill, who claimed that the Glazers were "running the club the right way". Meanwhile, membership of the Manchester United Supporters' Trust passed the 100,000 mark on 3 March, before exceeding 125,000 a week later. The green-and-gold scarf campaign also grew, with large portions of the Old Trafford crowd showing the colours. Following Manchester United's 4–0 victory over Milan in their Champions League first knockout round tie, former Manchester United player David Beckham was seen wearing a scarf that had been thrown onto the pitch; however, he later claimed that he was merely showing his support for Manchester United, and that the running of the club is "not [his] business". It was also claimed that United manager Alex Ferguson would be prepared to invest his own money in the Red Knights' bid, but he dismissed these reports as "absolute rubbish". Given the amount of debt on Manchester United's books at the time, some analysts estimated in 2010 that any takeover bid would have had to total more than £2 billion, of which around £1.6 billion would be needed to match the Glazers' valuation of the club – double what they paid for the club in 2005. However, the Red Knights publicly stated that they would only pay "a fair price" when their takeover bid finally came. On 11 March 2010, the Red Knights appointed Nomura Securities Co. as their advisers for their takeover bid. Nomura previously advised the Manchester United board before the Glazers' bid to buy the club. The Red Knights later admitted that they would not make a bid for the club before the end of the 2009–10 season, but it was believed that their preferred bid option would have involved retaining the £500 million bond issued by the Glazers. Two-thirds of a further £700 million would be provided by 30–40 wealthy Manchester United fans, with the remainder provided by fund-raising from ordinary fans. Once the club was secured, shares would then be offered to fans, allowing them to take ownership of the club. Despite these plans, the Red Knights put their takeover bid "on hold" in June 2010, citing "inflated valuation aspirations" in the media as the reason. Having already stated that they would only pay a "sensible" amount for the club, the group was thought to have baulked at the suggestion that the Glazers' valuation of the club was significantly higher than the amount they were willing to pay. In June 2012, after several months with no further developments on the Singapore front, several sources reported that the club was considering moving its share issue to the United States, and in July 2012, an application was made for the club to sell shares on the New York Stock Exchange (NYSE), with a target of raising $100 million (£64 million). More details of the sale were released at the end of July, with the club announcing that they intended to sell 16.7 million shares (approximately 10% of the club) at between $16 and $20 each, raising up to $330 million (£210 million). Shares in the club would be divided into two groups, with Class A shares sold to the public and Class B shares retained by the Glazer family. Ahead of the opening of the IPO, concerns were raised among both investors and Manchester United supporters regarding the details of the share offering. Although the share prospectus specified that the proceeds from the sale would go towards paying down the club's debts, it was revealed that much of the money would go directly to the Glazers. Furthermore, holders of class A shares would not be entitled to a regular dividend, and the structure of the share issue meant that the Glazers' class B shares had 10 times the voting power of class A shares, essentially denying a controlling interest in the club to anyone but the Glazers. These issues drove down interest and forced a drop in the share price from the planned $16–20 each to $14 each, representing a potential total sale value of $233 million (£150 million). The shares debuted on the NYSE on 10 August 2012, and initially showed a slight rise to $14.05 per share, but closed the day back at the offer price of $14 each, valuing the club as a whole at $2.3 billion, and making it one of the most valuable sports teams in the world. One of the biggest investors in the IPO was American billionaire George Soros, whose investment company purchased about 3.1 million class A shares (1.9% of the club), valued at $40.7 million (£25.8 million) at the time. Club records announced in November 2012 revealed that gross debt had fallen to £359.7 million after the share sale paid off £62.6 million of bonds. The club's debts were further remedied in May 2013, after a new loan deal was agreed that would save the club £10 million a year in interest payments on debts now totalling around £307 million. Conn, David (1997). The Football Business: The Modern Football Classic. Edinburgh: Mainstream Publishing. ISBN 1-84018-101-X. Crick, Michael; Smith, David (1990). Manchester United: The Betrayal of a Legend. London: Pan Books. ISBN 0-330-31440-8. Murphy, Alex (2012) . The Official Illustrated History of Manchester United (5th ed.). London: Orion Books. ISBN 978-1-4711-0262-2. 1 2 "Analysis of the Glazer bond documents shows Manchester United will haemorrhage over half a billion £ in cash in the next seven years". the andersred blog. 18 January 2010. Retrieved 7 May 2010. ↑ Bond, David (16 November 2010). "Manchester United's Glazer family to pay off PIK loans". BBC News. British Broadcasting Corporation. Retrieved 28 February 2014. ↑ "Manchester United shares debut in New York". BBC News. British Broadcasting Corporation. 10 August 2012. ↑ "Man Utd: Red Knights takeover attempt shelved". BBC News. British Broadcasting Corporation. 2 June 2010. Retrieved 19 August 2012. ↑ Murphy, pp. 36, 39. ↑ Crick and Smith, p. 58. ↑ Crick and Smith, p. 134. ↑ Crick and Smith, pp. 168–9. ↑ Crick and Smith, pp. 184–6. ↑ Crick and Smith, pp. 277–8. ↑ Crick and Smith, p. 284. ↑ Crick and Smith, p. 293. ↑ "Super Bowl hero takes a slice of Man Utd". BBC News. British Broadcasting Corporation. 2 March 2003. Retrieved 1 April 2011. 1 2 "US investor ups Man Utd stake". BBC News. British Broadcasting Corporation. 26 September 2003. Retrieved 6 August 2008. ↑ "US tycoon ups Man Utd stake". BBC News. British Broadcasting Corporation. 20 October 2003. Retrieved 5 September 2005. ↑ "Share deal sparks Man U bid talk". BBC News. British Broadcasting Corporation. 29 November 2003. Retrieved 5 September 2005. ↑ "US bid talk lifts Man Utd shares". BBC News. British Broadcasting Corporation. 13 February 2004. Retrieved 5 September 2005. ↑ "Glazer raises stake in Man United". BBC News. British Broadcasting Corporation. 24 June 2004. Retrieved 5 September 2005. ↑ "Glazer stake in Man Utd nears 30%". BBC News. British Broadcasting Corporation. 19 October 2004. Retrieved 5 September 2005. ↑ "Glazer wins control of Man United". BBC News. British Broadcasting Corporation. 12 May 2005. Retrieved 28 February 2014. ↑ "Q&A: Malcolm Glazer and Man Utd". BBC News (British Broadcasting Corporation). 16 May 2005. Retrieved 5 June 2014. ↑ "Glazer statement infuriates fans". BBC Sport. British Broadcasting Corporation. 13 May 2005. Retrieved 28 February 2014. ↑ "Glazer Man Utd stake exceeds 75%". BBC News. British Broadcasting Corporation. 16 May 2005. Retrieved 6 August 2008. ↑ "Man Utd shares leave stock market". BBC News. British Broadcasting Corporation. 22 June 2005. Retrieved 28 February 2014. ↑ "Glazer makes final Man Utd offer". BBC News. British Broadcasting Corporation. 23 May 2005. Retrieved 28 February 2014. ↑ "United board accepts Glazer bid". BBC News. British Broadcasting Corporation. 26 May 2005. Retrieved 28 February 2014. 1 2 "Glazer extends Man Utd deadline". BBC News. British Broadcasting Corporation. 14 June 2005. Retrieved 28 February 2014. ↑ "Glazer gets 98% of Man Utd shares". BBC News. British Broadcasting Corporation. 23 June 2005. Retrieved 6 August 2008. ↑ "Manchester United's profits flat". BBC News (British Broadcasting Corporation). 26 January 2007. Retrieved 5 June 2014. ↑ Taylor, Daniel (14 May 2005). "Ferguson seeks head to head with Glazer". The Guardian. London: Guardian News and Media. Retrieved 17 July 2011. ↑ Taylor, Daniel (8 April 2006). "Ferguson heaps pressure on rivals after Gill confirms he will stay on". The Guardian. London: Guardian News and Media. Retrieved 17 July 2011. ↑ Murray-Watson, Andrew (18 June 2006). "Glazer puts three more of his children on Manchester United's board". Telegraph.co.uk. London: Telegraph Media Group. Retrieved 17 July 2011. ↑ Stone, Simon (19 June 2006). "Three more Glazer siblings to join United board". The Guardian. London: Guardian News and Media. Retrieved 17 July 2011. ↑ Stone, Simon (24 January 2006). "Manchester United profits fall by £12.3m". The Scotsman. Johnston Press Digital Publishing. Retrieved 6 August 2008. 1 2 Bond, David (20 August 2010). "Manchester United owners hit by debt payment rise". BBC Sport. British Broadcasting Corporation. Retrieved 1 July 2011. ↑ "Man Utd play down fears after £660m refinancing". ESPN Soccernet. ESPN. 18 July 2006. Retrieved 6 August 2008. ↑ Power, Helen (6 August 2008). "Credit crisis one year on: Risky debt notes could be a losing game". Telegraph.co.uk. London: Telegraph Media Group. Retrieved 5 June 2014. ↑ "Manchester United debt hits £716m". BBC News. British Broadcasting Corporation. 20 January 2010. Retrieved 26 January 2010. ↑ "Manchester United to raise £500m". BBC News. British Broadcasting Corporation. 11 January 2010. Retrieved 26 January 2010. ↑ Wilson, Bill (22 January 2010). "Manchester United raise £504m in bond issue". BBC News. British Broadcasting Corporation. Retrieved 26 January 2010. ↑ Gibson, Owen; Taylor, Daniel (16 November 2010). "Manchester United fans want answers as Glazers prepare to pay off debt". guardian.co.uk. Guardian News and Media. Retrieved 8 September 2012. ↑ "The full details on the terms of the PIKs". the andersred blog. 16 November 2010. Retrieved 8 September 2012. ↑ Gibson, Owen (17 November 2010). "So how did the Glazers raise the money to pay off a £220m loan?". The Guardian. Guardian News and Media. Retrieved 8 September 2012. ↑ "Manchester United fans' discontent with Glazer family: in pictures". Telegraph.co.uk. London: Telegraph Media Group. 16 November 2010. Retrieved 2 August 2011. ↑ Hughes, Ian (23 January 2010). "Man Utd 4–0 Hull". BBC Sport. British Broadcasting Corporation. Retrieved 26 January 2010. ↑ "Prime Minister Gordon Brown warns football over debts". BBC Sport. British Broadcasting Corporation. 25 January 2010. Retrieved 26 January 2010. ↑ Conn, David (27 February 2010). "Manchester United fans prepare to show their true colours at Wembley". The Guardian. Guardian News and Media. Retrieved 5 June 2014. ↑ Hassan, Nabil; Roan, Dan (30 January 2010). "Wealthy Man Utd fans approach broker about takeover". BBC Sport. British Broadcasting Corporation. Retrieved 4 March 2010. 1 2 Sinnott, John (2 March 2010). "Financiers 'hold Manchester United takeover talks'". BBC Sport. British Broadcasting Corporation. Retrieved 4 March 2010. ↑ "Manchester United says debts have fallen". BBC News. British Broadcasting Corporation. 2 March 2010. Retrieved 5 March 2010. ↑ Wilson, Bill (3 March 2010). "Manchester United owners Glazers get backing from Gill". BBC News. British Broadcasting Corporation. Retrieved 5 March 2010. ↑ Pearce, James (10 March 2010). "Old Trafford under the spotlight". BBC Sport. British Broadcasting Corporation. Retrieved 5 June 2014. ↑ McNulty, Phil (11 March 2010). "Beckham shows true colours". BBC Sport. British Broadcasting Corporation. Retrieved 13 March 2010. ↑ "Sir Alex Ferguson dismisses Red Knights link". BBC Sport. British Broadcasting Corporation. 7 March 2010. Retrieved 14 March 2010. ↑ Wilson, Bill (2 March 2010). "Would-be Man Utd buyers will need deep pockets". BBC News. British Broadcasting Corporation. Retrieved 5 March 2010. ↑ "Manchester United Red Knights 'will not overpay'". BBC News. British Broadcasting Corporation. 5 March 2010. Retrieved 5 March 2010. ↑ "Manchester United suitors Red Knights appoint advisers". BBC News. British Broadcasting Corporation. 11 March 2010. Retrieved 14 March 2010. ↑ "Fans group Red Knights delays bid for Manchester United". BBC Sport. British Broadcasting Corporation. 26 March 2010. Retrieved 3 April 2010. ↑ Bond, David (2 April 2010). "Red Knights continue to plot". BBC Sport. British Broadcasting Corporation. Retrieved 3 April 2010. ↑ Moya, Elena (2 June 2010). "Manchester United's 'inflated valuation' dents Red Knights' ambitions". The Guardian. Guardian News and Media. Retrieved 5 June 2014. ↑ "Man Utd: Red Knights takeover attempt shelved". BBC News. British Broadcasting Corporation. 2 June 2010. Retrieved 11 July 2011. ↑ Wachman, Richard (12 June 2011). "Glazers eye Hong Kong listing for Manchester United". The Guardian. Guardian News and Media. Retrieved 28 February 2014. ↑ "Man Utd considers partial Asian flotation". BBC News. British Broadcasting Corporation. 17 August 2011. Retrieved 28 February 2014. ↑ "Man Utd to float stake in club on Singapore market". BBC News. British Broadcasting Corporation. 18 August 2011. Retrieved 28 February 2014. ↑ "Manchester United get approval for Singapore share sale". BBC News. British Broadcasting Corporation. 16 September 2011. Retrieved 28 February 2014. ↑ "Manchester United may move share sale to US reports say". BBC News. British Broadcasting Corporation. 14 June 2012. Retrieved 28 February 2014. ↑ "Manchester United seeks $100m New York stock sale". BBC News. British Broadcasting Corporation. 3 July 2012. Retrieved 28 February 2014. ↑ "Man Utd to sell shares at $16 each in New York sale". BBC News. British Broadcasting Corporation. 30 July 2012. Retrieved 28 February 2014. ↑ Conn, David (4 July 2012). "Manchester United tackle debt by floating on New York Stock Exchange". The Guardian. Guardian News and Media. Retrieved 28 February 2014. ↑ Anderson, Richard (1 August 2012). "Manchester United share sale causes controversy among fans and investors". BBC News. British Broadcasting Corporation. Retrieved 28 February 2014. ↑ James, Stuart (26 July 2012). "Manchester United's New York setback exposes failings of Glazers plan". The Guardian. Guardian News and Media. Retrieved 28 February 2014. ↑ "Manchester United lowers stock float value". BBC News. British Broadcasting Corporation. 10 August 2012. Retrieved 28 February 2014. ↑ "Manchester United shares debut in New York". BBC News. British Broadcasting Corporation. 10 August 2012. Retrieved 28 February 2014. ↑ "Manchester United: George Soros invests in football club". BBC News. British Broadcasting Corporation. 21 August 2012. Retrieved 28 February 2014. ↑ "Manchester United reduces debt to £359.7m". BBC News. British Broadcasting Corporation. 14 November 2012. Retrieved 28 February 2014. ↑ "Manchester United cuts debt costs". BBC News. British Broadcasting Corporation. 24 May 2013. Retrieved 28 February 2014. ↑ Green, Andy (13 March 2014). "Baron Capital's stake in Manchester United - getting the numbers right". Andy Green. Andy Green. Retrieved 7 October 2014. ↑ "Manchester United shares bought by US investment firm". BBC News. British Broadcasting Corporation. 11 March 2014. Retrieved 14 March 2014. ↑ Dzombak, Dan (7 October 2014). "Here's Why This Billionaire Fund Manager is Betting Big on Manchester United Stock". The Motley Fool. The Motley Fool. Retrieved 8 October 2014. ↑ "Malcolm Glazer dies: Man Utd's former owner dies aged 85". BBC Sport (British Broadcasting Corporation). 28 May 2014. Retrieved 29 May 2014.